I work with the Union Bank of Nigeria PLC; currently I am the senior manager of bills and exchange at the foreign remittance department of my bank. I was the account officer to one Mr. Ali B. Ashraf who died along with his family on the 8th of November 2001 in an ADC Boeing 727 plane crash at Egirin River. All 141 passengers on board were feared dead. He left in his domiciliary account the total sum of $15.5million Fifteen million five hundred thousand USA Dollars. Since the management got the information of his death we have been expecting any of his relation or his next of kin to come up and claim his money. Unfortunately from the day of his death till the time of this letter none of his relation or friends has come up for the claim. The banking and financial law of Union bank of Nigeria Plc stipulates that if such fund remained unclaimed after it will be transferred into the bank treasury as unclaimed bill. On this discovery sir, I and two other senior staffs now decided to do business with you and release the money to you as the next of kin to Ali B. Ashraf for safety and subsequent disbursement. I will soon proceed for my retirement leave this year, and I personally do not want this fund to be transferred into the bank treasury as unclaimed bill. That is why I wanted the fund to be move out of the bank before I proceed on my retirement from the banking services by December 15th 2003. The need for a foreigner as next of kin in this project is occasioned by the fact that the customer Mr. Ali Ashraf was a foreigner and a Nigerian cannot stand as his next of kin or heir. We have agreed that 20% of the Fund would be for you as foreign partner; thereafter my colleague and I will visit your country for disbursement according to the percentages indicated. To enable the immediate transfer of the fund into your nominated account, you will first apply to the bank as the next of kin of the deceased, indicating your bank account number and location wherein the money will be remitted. Upon receipt of your acknowledgement indicating your interest, I will send to you the text of the application that you will send to the Union Bank authority for an approval to submit your claims. Send your reply through my direct and private email address ([email protected]) indicates your direct Fax and telephone numbers for effective communication that this transaction needs. Do not reply through the union bank email address because it's belonged to the senior staffs for public use. Looking forward to urgently hearing from you. PLEASE QUOTE REF: JC/001/001 IN ALL CORRESPONDENCE. Many thanks for your detailed explanation of the facts, and I feel that I will be able to help you. Before I proceed I'll give you a little bit of information about myself. I am a partner in a company that manufactures clockwork pacemakers and blood transfusion machines. For an additional fee we also provide the keys to wind them up. My business partner is a boy named Sue. 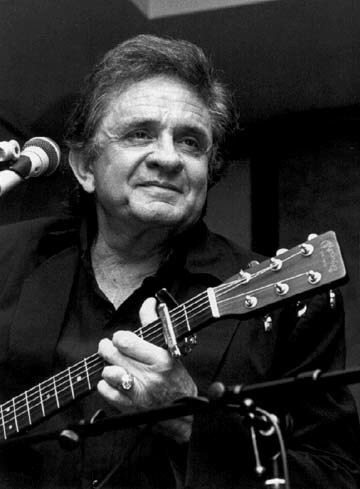 If he was here I am sure he would say 'how do you do? ', but of course I realise that it is best to keep deals like this strictly confidential, no need to get into a burning ring of fire! have been on the very same plane. How tragic. I have attached the last picture taken of me with my beloved pet. This was taken about 6 months before the accident. You can of course be assured of my 100% commitment and confidentiality over this deal. Please inform me how we are to proceed. If you wish to telephone me direct my number is +44 7092 037387. If I am not at home my answer service will take you message. Please Edward, if you have to leave a message you must say a password phrase so that I know it is you on the telephone (I get a lot of nonsense calls you see), please use the phrase "LUKE AT MY BOLLUX". Luke is the name of my dog, which no one else will know and Bollux is the name of my family mansion. One last thing before we proceed. Please will you send me some form of official identification for my records? THIS IS TO ACKNOWLEDGE THE RECEIPT OF YOUR MAIL AND THE CONTENTS WERE WELL NOTED. FIRSTLY,YOU ARE REQUIRED TO FORWARD TO ME YOUR PRIVATE FAX NUMBER AND YOUR BANK INFORMATIONS WHICH WILL BE FORWARDED TO THE BANK FOR THE ONWARD RELEASE OF THIS FUND INTO YOUR ACCOUNT. I AM GOING TO FORWARD EVERY OTHER INFORMATIONS YOU ASKED FROM ME NEXT WEEK,REMEMBER THAT THIS BUSINESS WILL ONLY LAST FOR FOURTEEN BANK WORKING DAYS,SO ANYTHING YOU ARE DOING YOU HAVE TO HASTEN UP SO AS TO ENABLE US MEET UP THE TIME. DURING THE WEEKEND THE OFFICIALS INVOLVED IN THIS TRASACTION WILL MEET TO DISCUSS THE WAY FORWARD FOR THIS TRANSACTION TO COMMENCE. PLEASE FEEL FREE TO CONTACT ME OVER MY PRIVATE TELEPHONE LINE 234-1-7762254 FOR FURTHER BRIEFINGS. Voicemail from Edward Uma. Received 19/09/03. Click HERE to listen. 44 seconds (72k). Edward was kind enough to (badly) say the password phrase "Luke at my bollux". HOW ARE YOU AND YOUR HEALTH? I GUESS ALL IS FINE WITH YOU. I AM EXPECTING THAT YOU FORWARD TO ME THE INFORMATIONS I REQUESTED FROM YOU BUT I DID NOT RECEIVE THEM OVER THE WEEKEND. PLEASE FORWARD TO ME YOUR PERSONAL/BANK ADDRESS,YOUR PERSONAL BANK ACCOUNT NUMBER WHERE YOU WANT THIS FUND TO BE TRANSFERED AND FAX NUMBER. I WISH TO INFORM YOU THAT THERE WAS A MEETING HELD AMONG US AS REGARDS THIS MATTER.WE ASSURED YOU 100% RISK FREE. PLEASE CALL ME UPON THE RECEIPT OF THIS MAIL ON MY PRIVATE TELEPHONE NUMBER 234-1-7762254 FOR MORE BRIEFING. Many thanks for your email, and my apologies that I was not home to receive your call, I am a very busy man. Thank you for leaving the message. The contents were well noted. Good to hear that everything is going well so far. Please note that as I requested previously, I will require some identification from you before I am prepared to provide my bank details. If you require further information, please try to call me, I will try to be home to take your call. If I am not home, again please leave a message. Note that the password phrase is now "ALWAYS LUKE ON THE BRIGHT SIDE OF LIFE". Once final question: do you have iguanas in your country? 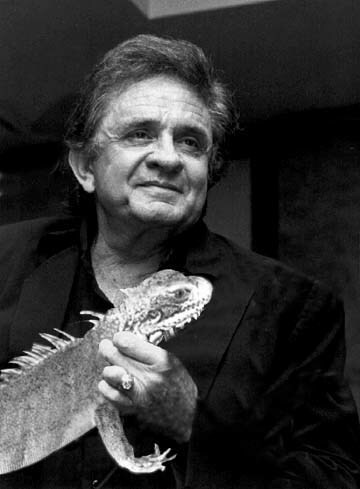 As you know I have a great interest in iguanas, and I also import them into my country to sell to others. They are very valuable here (worth at least $8,000.00 each) so I am looking to find a partner who can help me with this matter. THIS IS TO ACKNOWLEDGE THE RECEIPT OF YOUR MAIL EARLIER THIS MORNING AND ALL THE CONTENTS THEREIN WELL NOTED. IN THE FIRST PLACE, THE BEST THING YOU HAVE TO DO NOW IS TO FURNISH US WITH YOUR BANK INFORMATIONS AS I HAVE FORWARDED MY IDENTIFICATIONS TO YOU FOR YOUR SIGHTING. THIS INFORMATION WILL ENABLE US OBTAIN JOB APPLICATION FROM UNION BANK AUTHOURITY ON YOUR BEHALF AS I HAVE INTESTIFIED MORE EFFORTS TOWARDS CONCLUDING THIS TRANSACTION WITHIN THE TIME FRAME. PLEASE REMEMBER THAT THIS BUSINESS REQUIRES UTMOST SECRECY SO DO YOUR BEST TO KEEP IT WITHIN YOURSELF. 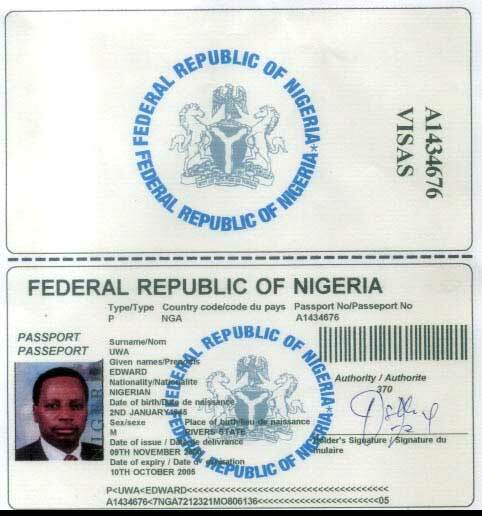 YOU ARE ADVISED TO CONTACT ME ON MY DIRECT TELEPHONE NUMBER 234-1-7762254 FOR MORE IMPORTANT BRIEFINGS AND ALSO DOWNLOAD YOUR ATTACHMENT AND VIEW MY INTERNATIONAL PASSPORT AND IDENTITY CARD FOR YOUR PERUSAL AND SIGHTING. THIS IS TO ACKNOWLEDGE THE RECEIPT OF YOUR EMAIL, AND CONTENTS NOTED.I RECEIVED ALSO THE COMPLETE INFORMATION OF YOUR BANK CORDINATES. WHAT WE ARE GOING TO DO NOW IS TO FORWARD YOUR INFORMATIONS TO THE VARIOUS PARASTATALS IN ORDER TO GET THE APPROVAL THAT WILL NECESSITATE THE SPEEDY TRANSFER OF THE U.S$15.5M DOLLARS INTO YOUR BANK ACCOUNT. HOWEVER,ALL THE OFFICIALS INVOLVED INCLUDING AN ATTORNEY WILL BE MEETING TODAY IN ORDER TO DISCUSS WITH THE ATTORNEY WHO IS GOING TO SECURE THE APPROVALS FROM THE VARIOUS AGENCIES.THIS IS IMPORTANT.WHEN WE FINALISE TODAY, THE LAWYER WILL MOVE IMMEDIATELY TO WORK ON THE APPROVALS WHICH ARE GOING TO BE DOCUMENTED ON YOUR NAME SO THAT ON OR BEFORE THE END OF WORK TOMMORROW HE WOULD HAVE GOTTEN ALL THE APPROVALS AND HAVE THEM FORWARDED TO YOU FOR YOUR PERUSAL. REMEMBER TO KEEP THIS BUSINESS SECRET FOR THAT IS THE WATCH-WORD FOR THE SUCCESSFUL CONCLUSION OF THIS TRANSACTION. DEAR JOHNNY,CONCERNING THE IGUANAS THAT YOU REQUESTED FOR A PARTNER WE ARE DOING EVERYTHING POSSIBLE TO LINK YOU WITH THE APPROPRIATE PERSON WHO IS RELIABLE IN TRANSACTING THIS BUSINESS WITH, BUT LET US FINISH THIS BUSINESS FIRST WHICH IS GOING TO LAST WITHIN SOME WEEKS. I TRIED TO PLACE A CALL TO YOU YESTERDAY NIGHT BUT IT WAS PLACED ON VOICE MAIL. PLEASE I WANT YOU TO ARRANGE A TIME WITH ME SO THAT I CAN SPEAK WITH YOU TODAY OR CAN YOU GIVE ME YOUR MOBILE NO SO THAT WE WILL BE COMMUNICATING BECAUSE WE NEED COMMUNICATION FOR US TO SUCCEDD IN THIS TRANSACTION. I WILL BE WAITING FOR YOUR CALL ON MY DIRECT LINE 234-1-7762254. I will try to be in later this evening to receive your call. I apologise for not being home, but I am a very busy man travelling all the time hunting those damn elusive iguanas. I thought I had one in the bag this afternoon, but after making an excellent shot with my crossbow, it turned out that what I thought was an iguana was in actual fact a sleeping kitten. Voicemail from Edward Uwa Received 23/09/03. Click HERE to listen. 42 seconds (68k). Edward get today's password phrase, "Luke on the bright side of life" slightly wrong! Subject: CONTACT THE LAWYER IMMEDIATELY. SEQUEL TO OUR CLOSE DOOR MEETING TODAY WITH THE ATTORNEY WHO IS GOING TO REPRESENT YOU IN ORDER TO OBTAIN THE APPROVALS FROM ALL THE NECESSARY QUARTERS,WE WRITE TO INFORM YOU THAT BARRISTER HARRY MARSHAL IS HENCEFORTH GOING TO ASSUME YOUR REPRESENTATIVES AS WE DOES NOT WANT ANYBODY IN THE BANK TO KNOW OF OUR INVOLVEMENT IN THIS TRANSACTION FOR SECURITY PURPOSE. NOW,THE ATTORNEY IS WAITING TO RECEIVE THE FINAL CONFIRMATION FROM YOU AS THE BENEFICIARY IN QUESTION THROUGH WHAT HE DESCRIBE AS "POWER OF ATTORNEY" BEFORE HE PROCEED WITH THIS ASSIGNMENT.YOU ARE THEREFORE ADVISED TO CONTACT THE ATTORNEY IMMEDIATELY VIA HIS EMAIL ADDRESS AS STATED:[email protected],TEL NUMBER 234-1-7764025. PLEASE CONTACT THE LAWYER IMMEDIATELY THROUGH HIS EMAIL ADDRESS OR TELEPHONE NUMBER AND GIVE HIM POWER OF ATTORNEY SO THAT HE WOULD BE ABLE TO OBTAIN THE NECESSARY DOCUMENTS ON YOUR BEHALF. JUST WRITE A LETTER OF AUTHOURITY WITH YOUR LETTER HEADED PAPER AND SEND IT TO THE LAWYER THROUGH EMAIL ATTACHMENT AUTHOURISING HIM TO BE YOUR REPRESENTATIVES. Please find attached my power of attorney document as requested by Edward Uwa. I hope this most pathetic effort is to your liking. Do you like iguanas Harry? Subject: OBEY THE LAWYER, HARRY MARSHAL. HOW ARE YOU THIS MORNING?I GUESS ALL IS FINE. THE LAWYER WHO IS GOING TO REPRESENT YOU AS THE BENEFICIARY OF THIS FUND, BARRISTER HARRY MARSHAL CALLED ME THIS MORNING TO INFORM ME OF THE GOOD NEWS, THAT YOU HAVE SENT THE POWER OF ATTORNEY TO HIM WHICH WILL ENABLE HIM REPRESENT YOU FULLY AND AT THE SAME TIME SEE TO THE PROCUREMENT OF ALL THE NECESSARY DOCUMENTS TO BACK THIS PAYMENT. PLEASE FEEL FREE AND COMMUNICATE WITH HIM FOR EVERYTHING ABOUT THE SUCCESSFUL END OF THIS BUSINESS REST ON HIS SHOULDERS,AND PLEASE ALWAYS UPDATE ME WITH EVERY CORRESPONDENCE YOU MAKE WITH HIM. Thank you for your email, and I look forward to speaking with the lawyer. One final question. I know that I mentioned Iguanas to you previously. I have now realised that in your country you also have Mowgli's. Sir, this is very exciting to me! Are you able to arrange export documents for Mowgli's? These creatures are very rare in my country. I am prepared to pay US $175,000.00 each for a Mowgli. I would immediately take 5 Mowgli's if you could get them, plus I would pay you another fee for the Mowgli export document/release forms. To facilitate fast processing I would be happy to pay cash. Please get back to me about this. THIS IS TO ACKNOWLEDGE THE RECEIPT OF YOUR MAIL TO ME AND THE POWER OF ATTORNEY YOU FORWARDED TO ME WHICH WILL GIVE ME THE POWER TO WORK FOR YOU. FIRSTLY,I AM A LAWYER OF HIGH REPUTE IN NIGERIA AND I SOLEMNLY PROMISING YOU THAT I WILL GIVE YOU MY 100% MAXIMUM CO-OPERATION IN AS MUCH AS YOU ARE GOING TO FOLLOW MY ADVISE. I WANT YOU AS A MATTER OF URGENCY SEND THE SUM OF U.S$2,500.00 DOLLARS AS MY MOBILISATION FEE WHICH WILL ENABLE ME COMMENCE ACTION ON YOUR PAYMENT AS THE OFFICIALS HERE HAVE AGREED THAT THEY ARE GOING TO PAY FOR THE PROCUREMENT OF THE NECESSARY DOCUMENTS THAT ARE INSTRUMENTAL FOR THE RELEASE OF THIS PAYMENT. NOTE THAT IT IS VERY PETINIENT FOR YOU TO SEND THIS MONEY TODAY BECAUSE ALL THE NECESSARY ARRANGEMENTS TO GET THIS DOCUMENTS HAS BEEN CONCLUDED.ONLY WHAT YOU HAVE TO DO IS TO MOBILISE ME SO THAT I WILL START ACTION. SEND THE MONEY THROUGH THE NAME OF OUR RECEIVING OFFICER MR.PETER UZOMAH VIA WESTERN UNION MONEY TRANSFER, LAGOS, NIGERIA,AND SEND THE INFORMATIONS ACROSS TO MY EMAIL BOX FOR MY PERUSAL. PLEASE FIND ATTACH A LETTER OF AGREEMENT WHICH YOU WILL SIGN AND FORWARD BACK. Please go ahead with the mobilisation, and remove your fee from the TOTAL AMOUNT, but, instead of taking just the small amount of $2,500.00 for your fee, please take $350,000.00 THREE HUNDRED AND FIFTY THOUSAND DOLLARS for your trouble. I will be happy to pay you this personally out of my 30% share. Hopefully my suggestion will hurry this matter along smoothly. Pretty good deal don't you think Harry? Remember, keep this quiet from Edward. Personally, I think Edward is a bit of a chancer. Three hundred and fifty big ones will go a long way for you Mr Marshal I'm sure. Just think of all the government officials you could bribe with THAT kind of cash. Go on; you know you want to. IN RECEIPT OF YOUR MAIL, IT IS WELL NOTED.MANY THANKS FOR THE U.S$350,000.00 DOLLARS OFFER. AT THE MOMENT, WHERE DO YOU EXPECT ME TO GET THE U.S$2,500.00 FROM. BE YOU INFORMED THAT NOBODY HAS THE STATUTORY RIGHT TO DEEP HIS HAND INTO THE U.S$15.5M DOLLARS BECAUSE WE ARE NOT THE OWNER OF THE FUND,EVEN THOUGH YOU ARE IN NIGERIA HERE YOU CAN'T BE ABLE TO TOUCH THE MONEY UNLESS THE MONEY IS CLEARED FROM THE BANK. I THINK YOU WILL UNDERSTAND THAT THIS MONEY IS IN THE BANK. IT WOULD NOT BE EASY FOR ANYONE TO TAKE MONEY FROM THE BANK WITHOUT DUE CLEARANCE.THAT IS WHY IT IS DIFFICULT IF NOT IMPOSSIBLE FOR ANYONE TO TAKE MONEY FROM THERE.I HOPE YOU WILL UNDERSTAND WHAT I AM TELLING YOU BECAUSE BANKING SYSTEM IS THE SAME ALL OVER THE WORLD. REMEMBER, YOU ARE DUELY INFORMED THAT 10% OUT OF THE TOTAL FUND OF U.S$15.5M DOLLARS HAS BEEN EARMARKED FOR THE SETTLEMENT OF LOCAL AND INTERNATIONAL EXPENSES SO ANY MONEY YOU SPENT IN REGARDS TO THIS BUSINESS WILL BE REINBURSED BACK TO YOU WHEN THIS MONEY IS FINALLY IN YOUR ACCOUNT. KINDLY, GO AHEAD AND SEND THE U.S$2,500.00 TO ENABLE ME GO AHEAD WITH THIS TRANSACTION. I WILL LIKE YOU TO KNOW THAT YOUR PROPER UNDERSTANDING AND QUICK RESPOSE IN THIS EFFECT WILL MAKE ME TO SERVE YOU BETTER. I WILL AWAIT YOUR URGENT REPLY. Your $2,500 fee is what you are charging for the clearance fees. These are your charges, which don't in reality cost you anything. My suggestion is that if you can carry on and then just make your charge upon the successful conclusion, you will be $350,000.00 richer instead of only $2,500.00 richer. This seems like good business sense to me. If you are not agreeable to this (and only a crazy man would say no) then to be sure you do not demand the $350,000.00 fee on completion of this deal, I will have to request that you sign a agreement to that fact. I will email you the agreement as soon as you signal you are not wanting to go ahead with my deal. Once I have the signed agreement I will then forward you the $2,500 by Western Union. PLEASE, REMEMBER THAT THIS U.S$2,500.00 DOLLARS I AM ASKING FROM YOU IS MY MOBILISATION FEES FOR ME TO COMMENCE WORK ON YOUR PAYMENT. THAT IS A NORMAL THING IN CONTRACTS EXECUTION. SO GO AHEAD AND SEND THE MONEY THROUGH WESTERN UNION TODAY SO THAT I WILL START WORK TOMMORROW BECAUSE TIME IS OF ESSENCE IN THIS NOBLE PROJECT. FINALLY, BE YOU ADVISED THAT I AM READY AND WILLING TO SIGN ANY AGREEMENT WITH YOU AS LONG AS THE CONTRACT IS NOT AGAINST ME. FORWARD IT IMMEDIATELY SO THAT I WILL ENDORSE IT. Find attached the agreement. Please sign it and return it to me. 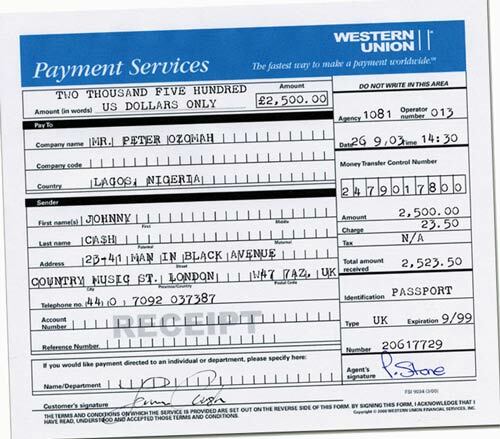 On receipt I will forward the $2,500.00 payment by Western Union. Subject: VIEW THE ATTACHMENT AND SEE THE SIGNED AGREEMENT. AS YOU HAVE DEMANDED, I HAVE SIGNED THE CONTRACT BOND YOU SENT TO ME. AS IT STANDS NOW, I AM LOOKING FORWARD TO RECEIVING THE U.S$2,500 DOLLARS MOBILISATION FEES IMMEDIATELY. SO RIGHT NOW THE BALL IS IN YOUR COURT. DO GO ALONG AND MAKE THE PAYMENT TO MR. PETER UZOMAH VIA WESTERN UNION AND LEAVE THE REST ACTION FOR ME TO PERFECT. Many thanks for your co-operation, it is duly noted. I shall be most happy to forward your payment before noon tomorrow (25th September). Please advise me when you receive the cash. HOW ARE YOU AND YOUR HEALTH? I GUESS ALL IS FINE WITH YOU. I JUST WANT TO USE THIS MEDIUM TO ASK IF YOU HAVE GOTTEN IN TOUCH WITH BARRISTER HARRY MARSHAL BECAUSE MY COLLEAQUES AND I HAVE CONCLUDED EVERY NECESSARY ARRANGEMENTS TO SECURE ALL THE DOCUMENTS THAT WILL NECESSITATE THE SMOOTH TRANSFER OF THIS MONEY INTO YOUR ACCOUNT. YOU KNOW NOW THAT YOU HAVE ASSUME THE BENEFICIARY OF THIS FUND, SO YOU HAVE TO DEAL DIRECTLY WITH THE LAWYER SO AS NOT TO ALLOW ANY PERSON TO KNOW THAT WE ARE INVOLVE TO AVOID CANCELLATION OF THE PAYMENT. I AM MAKING FRANTIC EFFORT CONCERNING THE IGUANAS BECAUSE I HAVE CONDUCTED A VERY GOOD RESEARCH AND I FIND OUT THAT THERE ARE LOTS OF CONCENTRATIONS OF IGUANAS IN NIGERIA AND I HAVE NOTIFY THE NIGERIA CHAMBERS OF COMMERCE AND INDUSTRY TO ARRANGE TO ISSUE YOU WITH THE EXPORT LICENSE TO ENABLE US HERE ARRANGE FOR THE SHIPMENTS OF SOME IGUANAS TO YOU. PLEASE THE SUCCESS OF THIS TRASACTION REST ON YOU SO GO AHEAD AND CONTACT THE LAWYER AND GET BACK TO ME. I have indeed been in touch with Mr. Marshal. I need to send him a Western Union payment. Unfortunately I cannot send it until later this evening as I am in Scotland picking up more iguanas. The moment I get back I will transfer the funds, if I can be at all bothered. I thank you for your frantic efforts to secure some iguanas, I shall reward you accordingly. The agent told me that to claim the money in Nigeria you will have to bring your passport for identification, and also quote the Money Transfer Control Number, which is 2479017800. You may also be required to answer a password phrase. The password question is: "ARE YOU GAY?" The password answer is "YES"
I await your reply ASAP. I can already smell the cash Mr. Marshal! I bet you wish you'd taken my 350 big ones now don't you?! Will the incorrect spelling of Peter's last name cause a problem?! THIS IS TO ACKNOWLEDGE THE RECEIPT OF YOUR MAIL,THE CONTENTS THEREIN WELL NOTED. 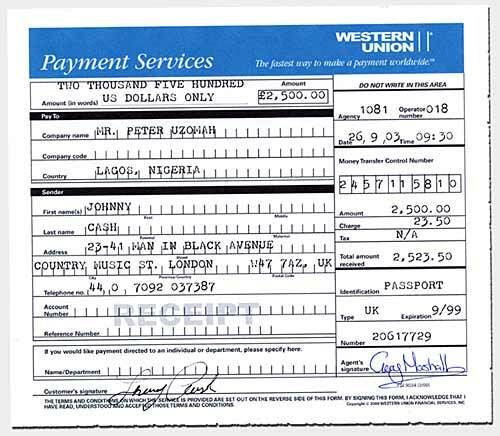 PLEASE, MY LEARNED FRIEND I WANT YOU AS A MATTER OF URGENCY CALL THE WESTERN UNION OFFICE WHERE YOU MADE THIS PAYMENT TO CORRECT THE SURNAME OF RECEIVING AGENT TO MR.PETER UZOMAH INSTEAD OF OZOMAH WHICH IS NOT CORRECT. WITHOUT MAKING THE CORRECTION IT WILL BE VERY DIFFICULT TO COLLECT THE MONEY FROM THE BANK.PLEASE GO AHEAD AND DO IT NOW AND INFORM ME THAT YOU HAVE DONE IT TO ENABLE THE RECEIVING AGENT TO COLLECT THE MONEY WITHOUT ANY HITCH. REMEMBER THE NAME IS MR. PETER UZOMAH TO AVOID ANY MORE MISTAKE. WHILE I AM VERY SURE I WILL HAVE A VERY GOOD NEWS FOR YOU ON MONDAY CONCERNING THE DOCUMENTS TO BACK UP THE TRANSFER. I WILL BE WAITING FOR YOUR RESPONSE IMMEDIATELY. I received your email yesterday. I do apologise for the mistake, and I will ensure the problem is corrected ASAP. Unfortunately it was too late to get back to the W.U. office, and they are closed today. I will have to send the corrected payment on Monday, if I can be at all bothered. HOW ARE YOU AND YOUR FAMILY?I HOPE ALL IS WELL. THE LAWYER CALLED, AND TOLD ME THAT HE WAS UNABLE TO RETRIEVE THE MONEY FROM THE BANK BECAUSE OF WRONG SPELLING ON THE SURNAME OF THE RECEPIENT. PLEASE MY BROTHER KINDLY GO NOW AND CORRECT THE MISTAKE SO AS TO ENABLE HIM COMMENCE WORK ON YOUR PAYMENT BY MONDAY BECAUSE WE HAVE PLANNED TO FINALISE THIS TRANSACTION WITHIN 14 BANK WORKING DAYS FROM NOW. I AM STILL IN TOUCH WITH THE EXPORT PROMOTION COMMISSIOM IN ORDER TO SEEK FOR THE EXPORT LINCENSE TO ENABLE US SHIP SOME IGUANAS THE MOMENT WE FINALISE THIS BUSINESS NEXT TWO WEEKS. MY BROTHER, GO AHEAD AND EFFECT THE CORRECTION AND GET BACK TO ME SO AS TO ENABLE ME KNOW WHAT TO DO. I WILL AWAIT YOUR URGENT RESPONSE. Subject: UZOMAH IS THE CORRECT NAME. PLEASE REMEMBER THAT YOU HAVE TO MAKE THE CORRECTION ON THE WESTERN UNION NAME TO MR. PETER UZOMAH AND NOT MR PETER OZOMAH. THIS MORNING. WHY IT IS IMPORTANT YOU DO IT IMMEDIATELY YOU RECEIVE THIS MAIL IS TO ENABLE THE RECEIVER TO CLAIM THE MONEY THIS MORNING WHICH WILL ENABLE ME COMMENCE WORK TODAY ON THE PROCUREMENT OF THE DOCUMENTS. Good morning to you sir! Please find attached the corrected W.U. payment. Please note that the control number has now changed because of the new payment. The control number is now 2457115810. The password and answer remain the same. I await the millions in my account ASAP. No hard feelings over the $350,00.00 is there Harry? Tell you what mate, I'll bung you an extra grand to show there's no hard feelings!